Prior to starting his tattooing career Eric was a musician who played the drums in two bands and had previously played the guitar at an early age. 14 years ago he started tattooing when his friend introduced him to a local tattoo shop owner. An inexperienced Eric began practicing his tattooing on himself and his close friends. It is in Eric’s nature to be drawn by the darker side of reality. He mentioned that biomech represents that absolute failure of his life on Earth and he finds it very ornamental as art. 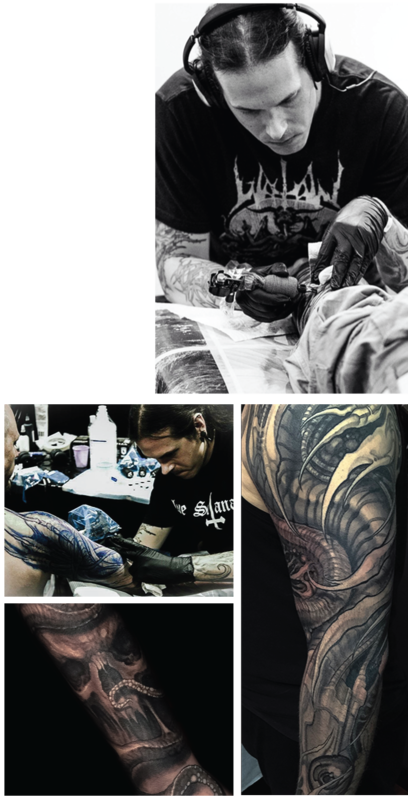 He now owns his own studio De L’etoile Tatoague where he and his team express the artistic side of evil, morbid and dark realities that he visions as a part of himself.